I had a chance to touch the lives (through a very very small gesture) of few less fortunate kids by associating with two organization in Bangalore working toward this goal of extending help to destitute, orphan, abused, abandoned children. Though I want to write a separate post about each, still on Children's day I would like to share some of my experience. Visit to ThayiMane : ThayiMane establishes and operates children's home that provides home based on a family model to destitute children, orphans, less fortunate and those who are abused. 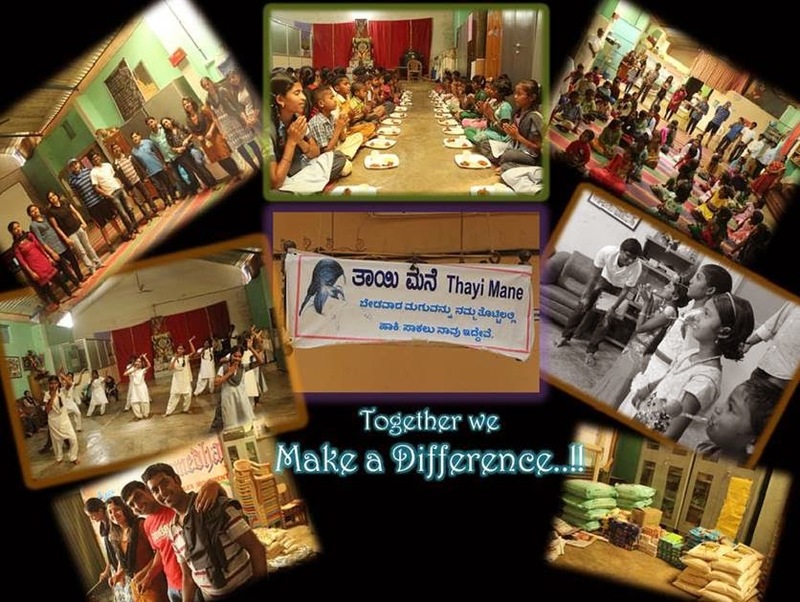 A visit to Thayi Mane was organized by SoftwareAG 'Make A Difference' group (MAD) on Saturday Nov 1. These are the posters we mailed to call for volunteers. We organized ‘Lemon & Spoon’ race for kids. Everyone enjoyed playing and when the results were announced, it was nice to see their sportiness to encourage the winners. Sometimes we may really need to learn a lot from the small angels. Later kids showcased their talent by singing and dancing. The show went on and on, our SAG volunteers joined them to dance and we had to force our self to stop the program. It was a pleasure seeing smiles and happiness while we served them special lunch. With all the kind donors from SAG, we were able to raise substantial donation and sponsored some essential items needed by the home. I was deeply moved by my meeting with the founder Mr. Thayimane Keshavamurthy and his wife, a very simple couple who considers this as a noble task and do not mind any difficulty coming his way. I liked the simple and peaceful surroundings and hats off to the real-life hero Mr. Keshavamurthy for dedicating his life for such children. Though may IT companies, as part of CSR, have come forward time to time to support Thayi Mane but such mission needs constant backing. The Minchu Gift Program: Through one of the resident in my apartment I participated in fulfilling wishes of two less fortunate kids. 4 government schools have been picked from the villages around Sarjapura Road by Minchu. Minchu is strictly a Non-Profit, Non-Government organization that solely works towards the individual happiness of underprivileged children across the city of Bangalore and its rural suburbs. One of the programs they run is a "Gift Program". · Their volunteers go to schools for underprivileged children and take a wish from each child. · These wishes are then written on a card with the child's name and other details. (Most of the wishes are very simple - a sports t-shirt, a badminton racket, a dictionary, a dress, etc.). · You can pick a card, buy the gift that the child has wished for, gift wrap it and hand over the Minchu team. · They will then pass it on to the child along with your special note, and make the child's wish come true! · The whole transaction does not involve any payments to the organization - the child tells you what they want, you buy the gift and the organization delivers it to the child. · The gifts are typically restricted to a value between Rs.300 and Rs.500, so that there is no large discrepancy across gifts to different children. This is indeed a worthy way of celebrating children's day! I hope to spend many more days like this, Kiran.. This is the real Childrens' day, nice work Roohi. Frankly telling, it is nothing Shweta.. All of us, the fortunate ones, should put lot more effort in helping the lesser fortunate ones.. That is the reason of my post and the existence of my blog.. To encourage and spread the word and make the world lot better..
Good you had a meaningful children's day. All the best. Children's day celebration in its true sense...Appreciate your good work. Wonderful post! Thank you Roohi for sharing.